Preheat oven to 350 degrees F (metal and glass pans) or 325 degrees F (dark or coated pans). Combine cake mix, eggs, sour cream, 1/2 cup milk, and vegetable oil until moistened (about 30 seconds). Scrape sides of bowl and beat on medium speed for 2 minutes. Stir in chopped apple. Spoon batter into paper-lined muffin pans, filling two-thirds full. Bake 18 to 20 minutes or until a wooden toothpick inserted in center comes out clean. Do not overbake. Remove to a wire rack to cool. Dollop caramel topping over 1 to 2 cupcakes at a time and very carefully spread almost to the edges. (The mixture is very sticky and can pull up the top layer of the cupcake if not done with care.) Immediately sprinkle with pecans and lightly press into the caramel topping. Continue decorating cupcakes 2 at a time until all are frosted and sprinkled with pecans. Insert a wooden stick into the center of each cupcake. Store covered in an airtight container. Frosted cupcakes are best served the same day. 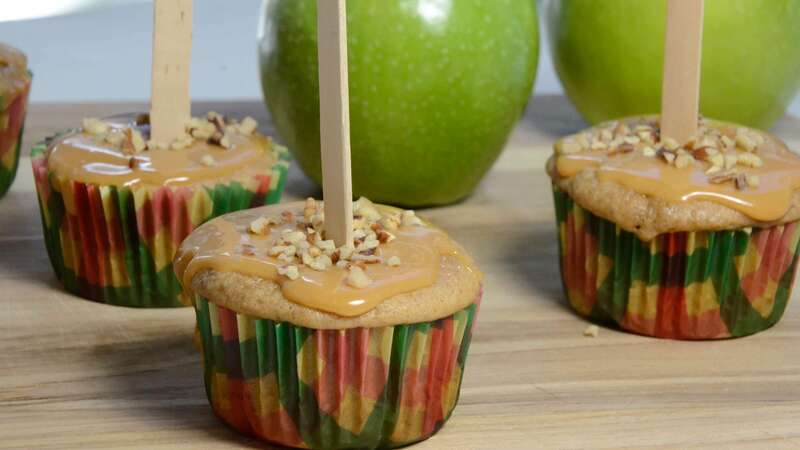 Caramel will soften if kept at room temperature for too long and will dribble down the sides of the cupcake liners. However, frosted cupcakes can be stored in the refrigerator until ready to serve. Just pull from the refrigerator about 20 minutes before serving so the caramel can soften up a bit. For best results, frost the cupcakes just before serving.